We save children’s lives and build healthy families. Founded in 1894, The Children’s Home Society of New Jersey is a nonprofit organization that helps at-risk infants, children, youth, and families achieve their potential. We protect abused or neglected infants and children, strengthen families, and strive for stable, permanent, and loving homes. CHSofNJ gives parents the knowledge they need to help their children and themselves long after our active services have ended. We see the positive results of our work every day. Click here for a summary of recent assessments and outcomes of our services. 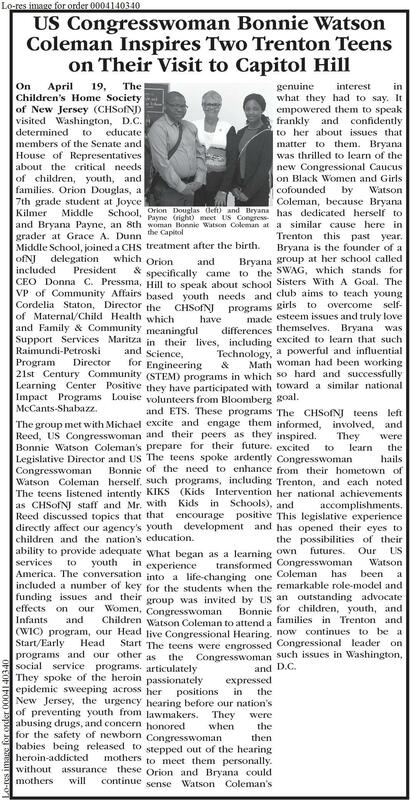 In April, a delegation of CHSofNJ representatives, including two of our remarkable 21st Century KIKS Positive Impact students, visited Capitol Hill and met with several of NJ’s Congressional Delegation to share information about critical issues to children and families.